This article was first published in March 2010. In view of the current water supply disruption experienced by folks residing in the Klang Valley, I think that a reminder to be mindful of water conservation and careful usage is timely. Commentaries based on more updated findings etc. are inserted in the article below and highlighted accordingly. As most of the newspaper articles cited in 2010 are no longer easily available online, luckily, I have curated the originals and shared these from my Google Drive. 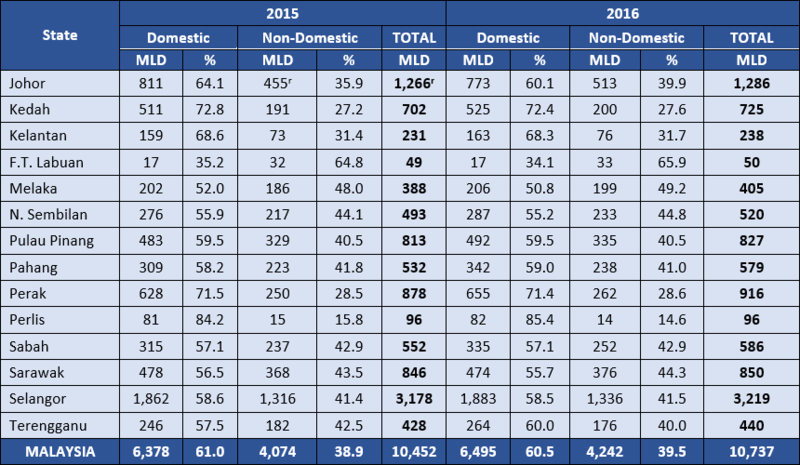 Interestingly, the National Water Services Commission (Suruhanjaya Perkhidmatan Air Negara – SPAN) has published water consumption data overall for different states in 2015 and 2016. For 2016, the overall domestic consumption was 6,495 million litres per day (MLD), a rise of 217 MLD compared to 2015’s figures. Thus with a population of 31.634 million in 2016, 205.32 litres per capita was consumed per day in Malaysia. It seems that we are still way ahead of our neighbours in our excessive consumption of water! It seems we had moved only slightly (less than 20 litres per capita per day) since 2010 when this figure was 225 litres per capita per day! Water Usage & Conservation: How do Malaysians fare? On the Sunday’s edition on 3rd Oct 2010, the New Straits Times (NST) published a very interesting headline article on how wasteful Malaysians are in our usage of water. The article drew mostly from “The Domestic Water Consumption Study”, which was a research collaboration between the Federation of Malaysian Consumers Associations (Fomca) and the Energy, Green Technology and Water Ministry. 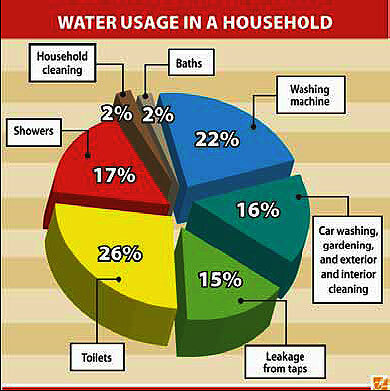 A look at the water usage data as depicted in the pie chart of the NST article revealed 17% of the usage of water is indeed wasted on leaked pipes. Now what the article did not reveal or it could be that the study did not have sufficient coverage of, is how such leakage have been classified. As without a detailed knowledge of the the types of leakage, it will not be possible to gauge how much of the 17% wastage can be saved by the consumer. This is because the leakage could have occurred in pipes and water conducting system from the source prior to the supply getting through to the households. However, the author thinks that a large proportion of this wastage could have been due to leakage that occurred inside the households. And the bulk of those affected may not have any of such knowledge as the sources of leak may be due to pipes that are buried in the gardens or on pavements leading to the house. Thus to stem this leakage, a lot of focus should be placed on educating the public on how to spot these leakages. The article also quoted Fomca’s President, Datuk N. Marimuthu’s comment that Malaysians waste a lot of treated water to flush toilet and that a dual-flush cistern system can save up to 60 litres of water per day for a household. However, realistically speaking, many people who are living in older houses or apartments will have the single-flush cisterns and the re-fitting of these will only be possible if there is a need to replace the cistern system and dual-flush system can only be attractive if the price of installation is equal or cheaper than the traditional single-flush system. Thus on the “toilet” front, what can we, as consumer who are environmentally conscious can do? For a start, there has been many ideas on saving cisterns water by putting in a small plastic bottle (a used shampoo bottle, preferably 500ml or less) that is filled with water and put inside the cistern. This will mean that the amount of water to fill the cistern is reduced because the volume is now partially occupied by the shampoo bottle. This may not be applicable in some cases where your cistern is not easily accessible….but with the shampoo bottle trick being a sort of “one-off” project, this should not be a deterrent to anyone with the initiative! The separation of treated water for drinking and untreated for toilet flushing will surely be the way forward but it will require substantial policy change and political clout to compel those in designing and building houses and apartments to install such systems. Of course the authorities controlling supply of water will also have to be in the position to supply both treated and untreated water in their systems. The second factor is more difficult to achieve as it will require substantial reconfiguration of piping of water and installation of new piping systems. So how do we find a way to save water usage on flushing toilets? Or more specifically, how can we have two supplies of water, one treated and one untreated for flushing toilets? In Malaysia, the only economically viable solution to have treated and non-treated supplies of water is to collect rainwater. Again, this collection of rainwater to be used as untreated water for flushing toilets can only be viably applied to new housing projects and commercial developments as it again involved having the necessary changes to the infrastructure to collect, store and distribute this second source of untreated water. However, having said this, it is still possible for those living in landed houses to do some collecting of rainwater for washing cars and for gardening. In this case, health and safety considerations have to be invoked so that the very act of saving water usage does not result in the spread of mosquitoes that leads to diseases like dengue fevers! There are many examples of innovations using basic tools and materials: a collecting tank (covered), some pipings to convey water from your rain gutters, a crude filter to remove debris (dead leaves and related stuff) and simple fish tank water pump to pump water up to a second tank in the roof or similar high places….then all you need to do is to wait for the rain to come to fill your lower tank. Malaysians are car lovers, so it will be a great achievement indeed if we can persuade car owners to use recycle or untreated water to wash their cars! This, the author thinks will deserve another study to determine. 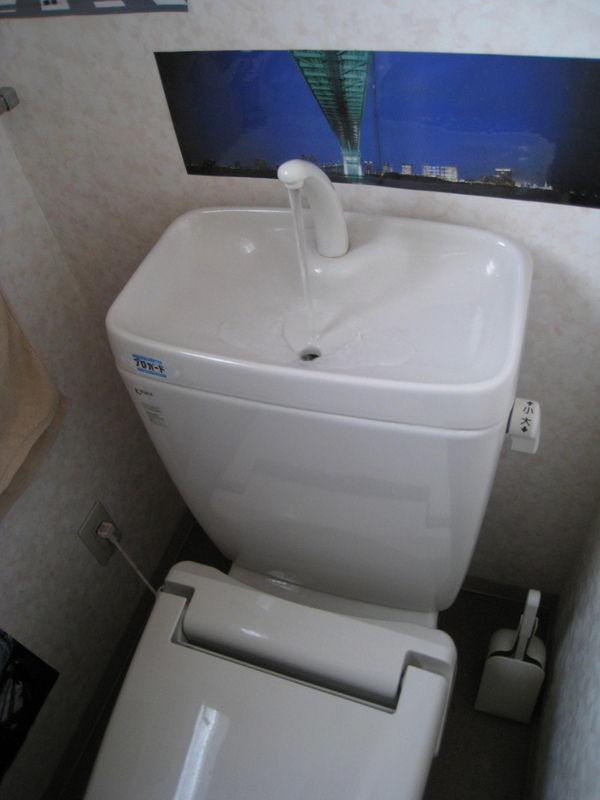 A few years ago, it was shown that in Japan wash basins are routinely piped in such a way that they can feed the cisterns of toilet directly with the waste water. This means that the water used with the wash basin (in most cases are for washing of hands) will fill up the connected cistern tank of a toilet thus reuse the water at least once more. Thus if we adopt the same idea in Malaysia, it will definitely contribute towards a substantial reduction in the demand for treated water to flush toilets. With clever re-positioning of the waste water outlets to feed a cistern (which may involve re-positioning of the cistern as well), this idea can be easily implemented. The author still remember as a young kid of 7 or 8 years old visiting Singapore for the first time in the 1970s that his aunt was keeping water used for washing clothes and using it to flush the toilet. It was his first experience of water conservation & recycling! But the modern lifestyle in urban Malaysia nowadays with automatic washing machines for clothing which accounts for a massive 22% of water usage in the country being a reality, it will take great innovation and a lot of education and political will for us to change this lifestyle to cut down that 22% usage to something more respectable. Firstly, it will need the policy makers to compel manufacturers of white goods to re-design their washing machines to consume less water and to do some recycling. But this may not be easily implementable or will only make an impact if the current crop of washing machines are replaced, which will take at least 10 years. The current designs of washing machines do not make it easy to harvest the water discharged, especially the those automatic washing machines. This is because all machines demand that the user place the discharge hose flat on the floor or directly into the waste water discharge hole in the sewage system and the collection of this water is very difficult indeed, unless one is placing the machine on a platform a couple of feet higher and let the waste water drain into a water tank or build a waste water tank below floor level. Putting these practical issues aside, it seems that the best potential for Malaysians to reduce the use of water is to recycle the washing machine water for flushing of toilets…..even if we can half the 22% usage to 11%, that is still a great deal of water. Perhaps it may be the most obvious way for the authorities in Malaysia to tackle water wastage issue, but the structural changes to new home designs (which is relatively easy to implement and “green-design” is helping to sell new housing projects) and some clever innovations on how existing landed property owners can easily and economically adopt such changes are badly needed. However, with many households in the country having relatively low water bills, the immediate incentive for any of such measures is difficult to be demonstrated. One question that lingers in the mind of the author is: why Malaysians are so wasteful when it comes to the usage of water? Is it because of the cost of water supply being so low? Is it due to the fact that we are spoilt by our being fortunate enough to have abundant supply of water and have no notion of conservation of water? Has the experience of water rationing in 1998 lost from our collective memory? All these could be, in singularity or collectively be the reason(s)! Perhaps we all should look at Malta where there may be an impending water crisis by 2025 to realise that if we do not do something now, eventually we will have to face the same problem. The fact of the matter is that the Maltese currently only uses 76 litres of water per capita [this figure was revised upward to 135 litres per capita per day in 2013]. Even with re-distribution projects being in place to pipe water from Pahang, the Klang Valley (according to the most optimistic statement coming from the current Menteri Besar) will be in water crisis by 2019, 6 years ahead of the Maltese!